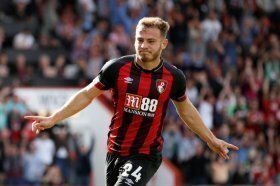 Arsenal have reportedly received a boost in signing Scottish winger Ryan Fraser from Bournemouth ahead of the forthcoming transfer window. The 25-year-old has enjoyed a standout campaign with the Cherries this term and he has already amassed seven goals and 11 assists in the top-flight alone. As such, he has caught the eye of many high-profile clubs including Arsenal and The Mirror claims that the Cherries are contemplating the attacker's sale during the summer. Fraser was pursued for just £400,000 by the Cherries in 2013 and reports indicated that they could receive at least 100 times of the valuation, should they sanction his sale. Bournemouth have been in discussions over a new contract with Fraser in the past year but they seem to have reached a deadlock with the attacker not in any rush to commit his future to the club. Fraser recently contributed a goal and an assist for the South Coast outfit as they secured a comfortable 5-0 triumph over Brighton & Hove Albion on the road.